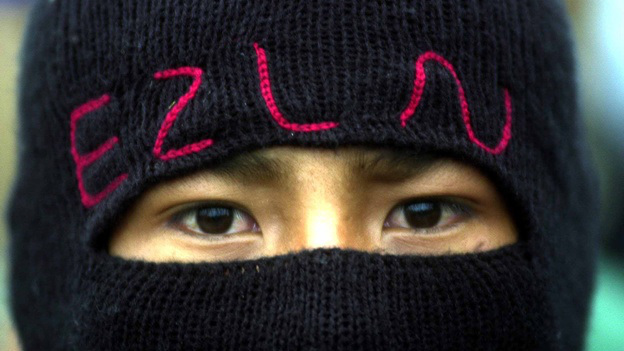 Compañeros and compañeras, brothers and sisters, we vehemently denounce the CIOAC paramilitaries organized by the three levels of the bad government against our bases of support of the Zapatista National Liberation Army – EZLN. On March 16 of this year, as we were carrying out an autonomous health drive with our Zapatista communities in the autonomous municipality of General Emiliano Zapata, headquartered in Amador Hernández, the CIOAC paramilitaries from La Realidad detained the Junta de Buen Gobierno’s [Good Government Junta] truck which was transporting medications for our campaign. They used the pretext of objecting to the two loads of gravel that our compañero bases of support in la Realidad were supplying for the construction of a dormitory for the health promoters working in the autonomous municipal health clinic in the municipality of San Pedro de Michoacán, headquartered in La Realidad. 1. The pretext: before, there had been an agreement about how the gravel could be used. But the paramilitaries of La Realidad have been using it to construct the chicken coops and pigpens that the bad government gives them as part of the dignified housing program, so now the paramilitaries do not allow our compañeros to use this gravel; this was their pretext. The paramilitaries, organized by the three levels of bad government in preparation for a counterinsurgency campaign, tried to provoke our Zapatista compañeros by acting against the Junta de Buen Gobierno, because instead of detaining the truck that transported the gravel, they detained the vehicle that was working in the service of the health of thousands of Zapatistas. They never intended to understand or resolve the situation. The leaders of the CIOAC paramilitaries are the ejido commissioner (comisariado ejidal) Javier López Rodríguez, paramilitary agente Carmelino Rodriguez Jiménez, Jaime Rodríguez Gómez, Eduardo Santiz Santiz, Álvaro Santiz Rodríguez, and Oscar Rodríguez Gómez. This was just a pretext for provocation, because there is a community agreement that the gravel is communal. The CIOAC paramilitaries of La Realidad are using that gravel to build the pigpens that the bad government calls dignified housing. And so the compañeros thought that they also had the right to use it. The paramilitaries of La Realidad are paid, organized, led, and trained by the three levels of bad government to divide and provoke the Zapatista people and the Zapatista autonomous government; this time they distorted the issue at hand and went after the Junta de Buen Gobierno. As the Junta, we wanted to resolve the situation, but they never wanted to come to an understanding, because it was the leaders of the CIOAC paramilitaries of la Realidad that brought their people against the Junta de Buen Gobierno, and as such the situation could not be resolved. They dragged the Junta de Buen Gobierno’s truck to their ejidal house and it is still in their hands today. 2. As the Junta de Buen Gobierno, we believed that we had an understanding with the other paramilitary leaders from the CIOAC-Histórico, which is to say the paramilitary leaders Luis Hernández, José Antonio Vázquez Hernández, Roberto Alfaro Velasco, Alfredo Cruz Calvo, Juan Carlos López Calvo, Romeo Jiménez Rodríguez, Víctor García López, Conrado Hernández Pérez, Gustavo Morales López, and Roberto Méndez Vázquez, and accompanied by some of their militants such as Adrián López Velásquez, Cesar Hernández Santiz from the community Victoria la paz; Bernardo Román Méndez, Enrique Méndez Méndez, who are from the Ejido Miguel Hidalgo; Misael Jiménez Pérez, Vidal Jiménez Pérez, Marconi Jiménez Pérez from Guadalupe Tepeyac; and Ismael Garcia Perez from San José la esperanza. And there are other accomplices who work from another site, including Gilberto Jiménez Hernández, Delmar Jiménez Jiménez, and Gerardo Hernandez Perez, the three paramilitary bosses who operate in Guadalupe Tepeyac. There are others from Guadalupe los Altos including Julio Rodriguez Aguilar, Carmellino Rodriguez Aguilar, Ranulfo Hernandez Aguilar and Alejandro Vazquez; from San Carlos Veracruz including Gaudencio Jimenez jimenez who works in the municipal presidency of Las Margaritas; and Gabriel Grene Hernandez, Isauro Mendez Santiz, Ivan Mendez Dominguez, Fidel Mendez Zantiz, and Alfredo Mendez Rodriguez, from Veracruz annexed to San Carlos. 3. Knowing the attitudes of the CIOAC paramilitary leaders, which is to say the Los Luises gang, we first went to the Human Rights Organization Fray Bartolomé de las Casas. We explained the acts of provocation against us, and “Frayba” explained it to Los Luises and gave them a summons with the date of March 31. There was a first summons, and then a second, and a third. The response was that if the summons was for the problems with the CIOAC from Guadalupe los Altos, Santa Rosa el Copan, Diez de Abril, San Francisco or San Jose el Puente, then that isn’t their problem. Frayba explained the situation around the summons and, moreover, the summons itself specifies the problem with the CIOAC paramilitaries in la Realidad, but they didn’t present themselves. 4. We again sent a second summons through Frayba and the response was that they were going to come, but they never did. Seeing this with concern, we had to go to the Frayba offices to explain more fully the reason for the call and that they should go directly to tell the Luises, the paramilitary leaders. Not until the third citation was sent did they come. We asked for Frayba’s presence as a witness for a peaceful solution and they set the date of the meeting for May 1 of this year. 5. The first to arrive were Roberto Alfaro Velasco, secretary of the CIOAC, and Alfredo Cruz Calvo, their secretary of transportation. One of them, Alfredo Cruz Calvo, went to talk to his CIOAC paramilitary compañeros in La Realidad, and he returned to tell us, the members of the Junta de Buen Gobierno, that they hadn’t understood – exactly as they have been taught to act. They proposed to us that they would go and talk to some of the other paramilitary leaders in La Realidad, but that was backbiting trickery because they didn’t go talk to the paramilitaries in La Realidad – they went to speak with the paramilitary boss of the Luises. When Alfredo returned, after supposedly having gone to talk to the paramilitaries in La Realidad, he brought 15 people with him telling us that we had to free Roberto Alfaro. In other words, he didn’t come to address the problem but to tell us that one of them was going to stay to talk to the leaders in La Realidad. Once the discussion began, it was made clear to them that Roberto Alfaro had neither been kidnapped nor detained. The 15 people they brought were the ones forcing Roberto Alfaro to say that he had been kidnapped and detained, and Frayba was a witness to all of this; they were there the whole time. Roberto Alfaro asked those 15 people to go talk to the paramilitaries in La Realidad but they refused. On May 2 we were about to reach an agreement at about five or six in the evening to establish another dialogue the following day. But those 15 and the paramilitary head of the Luises were already organizing something else outside. On the evening of May 2 the Zapatista compañeros bases of support were arriving to our Caracol to work on other zone projects, and these paramilitaries were planning an ambush at the entrance to the community in order to attack our compañeros. The paramilitaries in La Realidad already had a plan organized. They had split into two groups – one at the entrance to the community and the other in the middle of the community. They had both long and short weapons – machetes, clubs, and rocks. Before they carried out the murder, they began their provocations by destroying ourcompañeros autonomous school and cut the water piping that supplied water to our Zapatista bases of support and to the center of the caracol. We saw and heard it happen. As this was happening, the compañeros were arriving to work on other zone projects, and immediately the La Realidad paramilitaries ambushed the entrance road to the community and began attacking our compañeros with rocks and clubs, destroying the trucks’ windshields. Our compañeros managed to get out of the trucks however they could and defended themselves. We as Junta de Buen Gobierno were informed immediately that our compañeros were being attacked, and other compañeros who were working in the caracol came out to help, but they were unable to reach them. They were attacked with firearms in the middle of the community, and that is where our compañero José Luís Solís López fell; he was a zone level teacher in our Little School “Freedom According to the Zapatistas.” He was shot in the right leg and the right side of the chest with a .22 caliber bullet, cut across the mouth with a machete, and received a coup de grace to the back of the head with a weapon of the same caliber. He had also been clubbed many times on the back. – Romeo Jimenez López, shot twice: once in the right leg and another in the left leg with a .22 caliber bullet. – Andulio Gómez López, grazed in the chest with a .22 caliber bullet. – The compañero Abacuc Jimenez López, struck by a machete blow to the right arm. – The compañero Yadiel Jimenez López, struck by a machete blow, also to the right arm. – The compañero Efraín, struck by a rock blow to the head. – The compañero Gerardo, struck by a rock blow to the mouth. – The compañero Ignacio, struck by a rock blow to his right hand and to his brow. – The compañero Esau, struck by a rock blow to his brow. – The compañero Noe, struck by a rock blow to his head. – The compañero Saul, struck by a rock blow to his right arm. – The compañero Elder Darinel, various blows to his neck. – The compañero Hector, struck by a rock blow to his eye. – The compañero Marin, struck by a rock blow to his mouth, destroying his teeth. – The compañero Nacho, struck by a machete blow to his hand and eye. – The compañero Jairo, struck with blows to his back. Our compañeros were transported to our hospital-school “La Primera Esperanza Compañero Pedro” for medical attention. 6. We adamantly refute that we were armed. If that had been the case, the outcome would have been different. This took place at 8:30pm on May 2. That little mob of paramilitary leaders – those 15 who were with us – were told to go outside and control their people, but none of them would go. 7. Today, May 5, we see that the bad government in Chiapas had detained five people. One of them is a CIOAC paramilitary leader, Conrado Hernández Pérez; we don’t know the others. But they know exactly who they are, especially their paramilitary head, Manuel Velasco Cuello, and their supreme paramilitary-in-chief, Peña Nieto. However, those murderous paramilitary criminals who took the life of our compañero José Luís Solís López, and shot him coup de grace style have not been detained. They are still in La Realidad, keeping up their provocations, and they will continue to do so because this is the plan of the supreme paramilitary-in-chief, the top paramilitary in Chiapas, and the paramilitary bosses of CIOAC. 8. As you can see from what we’ve recounted, the Fray Bartolomé de Las Casas Human Rights Center was present at every moment. This is why we did not put out our own statement on what took place quickly. Out of respect for their mediation role and impartial perspective, we waited for Frayba to issue its neutral account, the way it does with all the issues it handles. In Frayba’s statement you can see directly who is lying and what the truth is, according to those who were present but did not belong to any of the groups involved. 9. Now it can be clearly seen that everything that the paid press reported is a lie. There was never a confrontation. There was an attack against us. 10. In light of this problem and the cowardly murder of our compañero Galeano, the Junta de Buen Gobierno has decided to withdraw its participation and hand the entire issue over to the General Command of the Zapatista Army for National Liberation so that it can take charge of the investigation and help bring about justice. Now we have to wait for what our EZLN compañeros have to say.